Mercy Otis Warren (September 14, 1728 – October 19, 1814) was an American writer, poet, and playwright. She was known as the "Conscience of the American Revolution." Having written anonymous anti-British and anti-Loyalist plays from 1772 to 1775, Warren was America's first female playwright. She was also the first woman to publish an anti-Federalist interpretation of the American Revolution. Her three-volume work, History of the Rise, Progress, and Termination of the American Revolution (1805), covered the three decades leading up to and including the Revolutionary War. She was a respected associate of Thomas Jefferson, John Adams, and many other notables of the period. The Massachusetts Committee of Correspondence was formed at her home in 1772. Unique for her time, Warren held that within the concept of natural rights at the core of the revolution was the principle of equality between men and women. She believed that with the right opportunities and good education, women could contribute as much as men could to society. She married James Warren, who was elected speaker of the Massachusetts House of Representatives and president of the Massachusetts Provincial Congress and later served as paymaster to George Washington's army during the Revolutionary War. They raised five sons. She died at 86 and was buried near her family's hometown of Plymouth, Massachusetts. Mercy Otis was the third child of 13 born in 1728 to Colonel James Otis Sr. (1702-1778) and Mary Allyne Otis (1702-1774) in Barnstable, Massachusetts. Her mother was a descendant of Mayflower passenger Edward Doty, while her father was a farmer, merchant, and attorney, who served as a judge for the Barnstable County Court of Common Pleas and later won election to the Massachusetts House of Representatives in 1745. 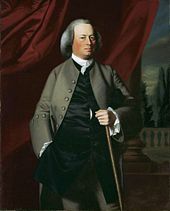 James Otis Sr. was a leading opponent of British rule and an outspoken critic of the appointed colonial governor, Thomas Hutchinson. Although Mercy had no formal education, she studied with the Reverend Jonathan Russell while he tutored her brothers in preparation for college. She loved history—especially political history—and was fond of rhetoric that displayed invective and wit. Sir Walter Raleigh's History of the World (1614) became a lifelong model for her. She also studied literature, including Shakespeare, Milton, Dryden, and Pope, and became an able writer and rhetorician. 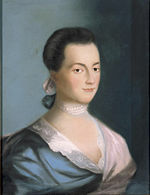 One of her brothers was the noted patriot and lawyer James Otis, Jr., who is credited with the quote "taxation without representation is tyranny," the principal slogan of the American Revolution. In 1754, Mercy married James Warren, a prosperous merchant and farmer from Plymouth, Massachusetts, when she was 24 years old. A descendant of the Mayflower passenger Richard Warren, he was a Harvard graduate and colleague of her brother. They settled in Plymouth, just a few miles north from her home and had five sons, James (1757-1821), Winslow (1759-1791), Charles (1762-1784), Henry (1764-1828), and George (1766-1800). Her husband had a distinguished political career. In 1765 he was elected to the Massachusetts House of Representatives and eventually became speaker of the House and president of the Massachusetts Provincial Congress. He also served as paymaster to George Washington's army for a time during the Revolutionary War. 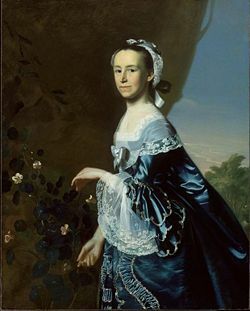 Mercy actively participated in the political life of her husband, and they became increasingly involved in the conflict between the American colonies and the British government. Their home became a focal point of local politics where they hosted protest and strategy meetings for the Sons of Liberty, among whom was their friend, John Adams. 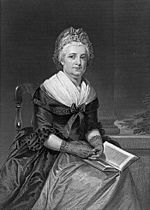 Mercy herself became a strong political voice with views on liberty, democracy and independence for the American colonies. James encouraged her to write, fondly referring to her as the "scribbler," and she became his chief correspondent and sounding board. Mercy Otis Warren died in October, 1814, at the age of 86. She is buried at Old Burial Hill, Plymouth, Massachusetts. Warren formed a strong circle of friends with whom she regularly corresponded, including Abigail Adams, Martha Washington, and Hannah Winthrop. In a letter to Catherine Macaulay she wrote: "America stands armed with resolution and virtue; but she still recoils at the idea of drawing the sword against the nation from whence she derived her origin. Yet Britain, like an unnatural parent, is ready to plunge her dagger into the bosom of her affectionate offspring." Through their correspondence, these women increased the awareness of women's issues and influenced the course of events to further America's cause. Warren also became a correspondent and adviser to many political leaders, including Samuel Adams, John Hancock, Patrick Henry, Thomas Jefferson, George Washington, and especially John Adams, who became her literary mentor in the years leading to the Revolution. In a letter to James Warren, Adams wrote, "Tell your wife that God Almighty has entrusted her with the Powers for the good of the World, which, in the cause of his Providence, he bestows on few of the human race. That instead of being a fault to use them, it would be criminal to neglect them." The Massachusetts Committee of Correspondence was formed during a political meeting at the Warren's home in 1772. She later wrote that "no single step contributed so much to cement the union of the colonies." Since she knew most of the leaders of the Revolution personally, Mercy was continually at or near the center of events from 1765 to 1789. She combined her vantage point with a talent for writing to become both a poet and a historian of the Revolutionary era. However, all of her works were published anonymously until 1790. When the colonies began to rebel against English rule, Mercy Otis Warren became perhaps the most important of Revolutionary War women. She wrote several plays, including the satiric The Adulateur (1772), directed against Massachusetts Governor Thomas Hutchinson. The play foretold the coming Revolution. In 1773, she wrote The Defeat, also featuring the character based on Hutchinson; and in 1775 she published The Group, a satire conjecturing what would happen if the British king abrogated the Massachusetts charter of rights. The anonymously published The Blockheads (1776) and The Motley Assembly (1779) are also attributed to her. In 1788 she published a political treatise, Observations on the New Constitution, whose ratification she opposed as an Anti-Federalist. In 1790, at the age of 62, Warren published Poems, Dramatic and Miscellaneous. The first work bearing her name ("Mrs. M. Warren") the book contains 18 political poems and two plays. The two dramas, The Sack of Rome and The Ladies of Castille, dealt with the social and moral values necessary to the success of the new republic. Both of these plays showed republics undermined from within by the loss of civic virtue. Mercy Otis Warren was known as the "Conscience of the American Revolution"
Other, more personal poetry, she kept unpublished until almost two centuries after her death. Her letters to hundreds of contemporaries (including Franklin, Jefferson, Hamilton, and Abigail Adams and her husband John—with whom Warren quarreled as Adams grew increasingly conservative) have now been published and are of great use to scholars for historical insight into the time. Although she was excluded from direct involvement in the development of the Revolution because of her gender, she nonetheless did bring much influence on the men who worked at the center of the activities and at times acted as their conscience, spurring them to action. During the French Revolution she wrote that revolutions are "permitted by providence, to remind mankind of their natural equality." However, she saw greater significance in the American Revolution, believing that it represented a permanent shift in Western political philosophy. In an age where most people thought democracy an impossible ideal sought by the ignorant masses, she understood that the "natural rights philosophy" exhibited in the Declaration of Independence would lead to democracy and egalitarianism for everyone. Her radical beliefs even led her to oppose the ratification of the Constitution in the late 1780s. Almost at the onset of the Revolution, Warren began her three-decade-long history of the event. It was finally published, in 1805, when she was 77, as a three volume work entitled, History of the Rise, Progress, and Termination of the American Revolution. 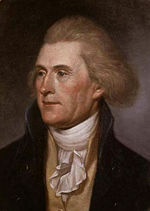 President Thomas Jefferson ordered subscriptions for himself and his cabinet and noted his "anticipation of her truthful account of the last thirty years that will furnish a more instructive lesson to mankind than any equal period known in history." She found it difficult to write of the battlefield in her History, as no woman had done so before. She thus undertook the task with "trembling hand." In this work, not only did she offer a timeless insider's view into the Revolution and the cast of characters that brought it to fruition, but she also opened the way for women to be respected as professional historians and writers. However, the book pointedly did not acknowledge John Adams' remarkable diplomatic achievements in France and the Netherlands, criticizing him instead for his supposed "partiality in favor of monarchic government." Her sharp comments on Adams led to a heated correspondence and a breach in her friendship with the Adamses, which was already shaky due to their differing opinions on the proposed constitution. In her later years she focused on educational reform. She criticized the fact that women had to do needlework while men learned Latin, Greek, history and politics. She denounced the artificial limits on women's achievements, arguing that these harmed both men and women and violated the philosophy of natural rights that lay at the heart of the Revolution. In her letters to Abigail Adams, she wrote of her belief that the "relegation of women to minor concerns" reflected not their inferior intellect but the inferior opportunities offered them to develop their capacities. This theme has caused her to be regarded as a "proto-feminist" in recent times, and she has been studied by feminists as a pioneer of her age. Although her writings have little else in common with modern feminism, she was indeed a leading woman of her own era who did much to begin the process of change in the accepted role of women within the greater society. Warren lived her entire life in the state of Massachusetts, but she lived in the company of revolutionaries, visionaries and many of the Founding Fathers of the emerging United States. Her own family home was the venue for numerous discussions which led up to the break with England and the establishment of a democratic nation. She was both an eyewitness to and the conscience of the Revolution, due to her skill in writing. Her History chronicles the three decades leading up to and including the Revolution. She was well respected by many of the most prominent men of the era. Warren was also a pioneer for women writers, poets and historians, and her passion for freedom and liberty pushed many to move forward towards independence. Her vision of the permanent state of democracy in the United States encouraged others to consider its lasting value. She was as much a part of the Revolution as any man who carried a gun or wrote a document. She did this as she raised five sons and ran her household. Sometimes characterized as a proto-feminist, she wrote with the expectation of the realization of the natural rights of women. While recognizing both physical and social differences between men and women, she understanding that the mind of both genders could be equally valuable. To this end she realized that women needed education as much as men and pushed for schools to be established for women and girls. Although not a feminist in contemporary terms, she was unique in her time, writing and working for equal respect and equal rights for women, regardless of station in life. The SS Mercy Warren, a World War II Liberty ship launched in 1943, was named in her honor. In 2002, she was inducted into the National Women's Hall of Fame in Seneca Falls, New York. ↑ Mercy Otis Warren, Heath Anthology of American Literature Retrieved December 21, 2008. ↑ Overview of Warren's life from Doris Weatherford. American Women's History: An A to Z of People, Organizations, Issues, and Events. (New York: Prentise Hall, 1994), 364-365. Retrieved December 26, 2008. ↑ Mercy Otis Warren's Gendered Melodrama of Revolution by Nina Baym Retrieved December 26, 2008. Baym, Nina. "Between Enlightenment and Victorian: Towards a Narrative of American Women Writing History," Critical Inquiry Autumn 18(1) 1991. Warren, Mercy Otis, and Lester H. Cohen, ed. The Rise, Progress and Termination of the American Revolution, Interspersed with Biographical, Political and Moral Observations. Liberty Classics, 1988 (modern reprint of orig. 1804 edition). History of "Mercy Otis Warren"
This page was last modified on 18 September 2018, at 16:23.